In the last few years, wheatgrass has made a big name for itself in the health industry, finally appearing on the list of ‘superfoods’. People have been switching from their regular beverages to a nicely made wheatgrass juice because of the health advantages it contains. And those who can’t stand the grassy flavor of the juice, relax. You have a solution in the form of wheatgrass powder. Here you will know the benefits of wheatgrass powder. So, if you are yet to jump on this ‘health bandwagon’, let me give you 39 reasons to start using it right now. Are you ready? Wheatgrass generally refers to the food prepared from the cotyledons of the wheat plant (Triticum aestivum). Is wheatgrass powder good for you? Well, it has great health and therapeutic benefits. It contains 19 amino acids and 92 minerals that enable the body to function at its best. It is commonly known as bread wheat and is cultivated in a greenhouse or under artificial lighting indoors. Wheatgrass powder is a dietary supplement obtained from extracting the dehydrated juice of wheatgrass. It is prepared from the grass grown naturally on the field for three or more months before being dehydrated. The primary reason for the numerous health benefits of this powder is its concentrated chlorophyll content (about 70%) in addition to the 98 of 102 earth elements it contains, including calcium, iron, phosphorus, magnesium, and potassium. It also contains essential enzymes. Chlorophyll is touted to be the blood of the plants; and when consumed by humans, it helps reverse aging, suppress hunger, combat odor, cleanse the blood, and even prevent cancer. The best part is that unlike wheat, this supplement is gluten-free. 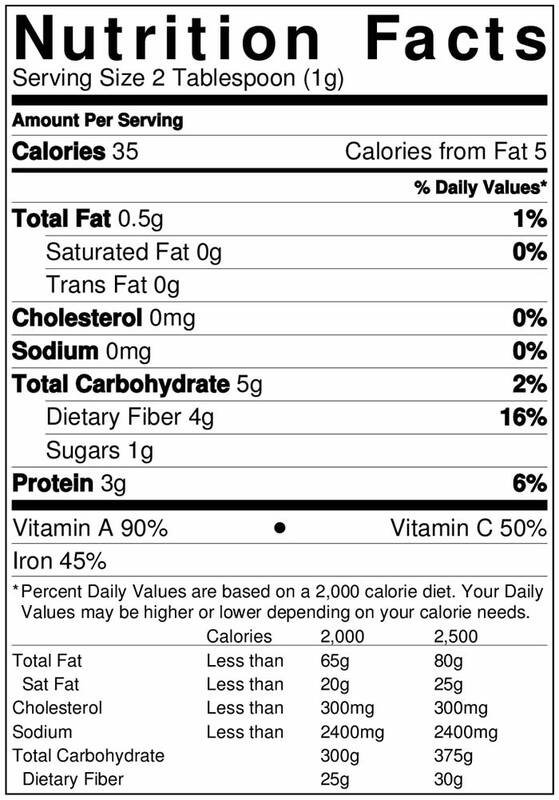 Each tablespoon contains only 18 calories. Wheatgrass powder can be mixed in water to make a nutritional drink or it can even be added to juices and smoothies. It contains all the properties of the wheatgrass plant, including nutrients, vitamins, and minerals – and, that too, in balanced proportions. Without much ado, let’s quickly look at what are the benefits of wheatgrass powder for your skin, hair and health. Wheatgrass powder is a great skin cleanser. It exfoliates your skin by removing dead skin cells. Wheatgrass also facilitates an internal rejuvenating mechanism, enhancing the youthful glow and elasticity of your skin (1). 1. Mix the two ingredients to make a smooth face mask. 2. Apply this paste evenly on your clean skin and let it stay for 15 to 20 minutes. 3. Wash it off using warm water and apply a bit of coconut oil if your skin is too dry. 4. You can repeat this process twice a week for best results. Wheatgrass powder, through its detoxification process, prevents the occurrence of breakouts and acne and promotes healthy skin. Applying a paste made with wheatgrass powder and milk in a 2:1 ratio is effective in treating acne, freckles, black/whiteheads, and skin tan. Use this paste once a week for two months to get amazing results (2). Due to its antiseptic properties, wheatgrass powder is ideal for healing bruises, sores, insect bites, rashes, cuts, and scrapes. It also helps in treating rashes due to poison ivy. It soothes boils and heals athlete’s foot (3). This powder possesses natural anti-aging properties. They aid in rejuvenating the skin cells, thereby slowing down the aging process. Wheatgrass tackles the problem of sagging skin and enhances skin elasticity, thus restoring the youthful glow of your skin (4). Also, the abundance of chlorophyll plays an important role in the anti-aging properties of wheatgrass. Chlorophyll is rich in enzymes and superoxide dismutase (a copper based protein found in RBCs) that help scavenge free radicals in the body, thus slowing down the aging process. Wheatgrass has been found to be super-effective in the treatment of various skin diseases, including eczema and psoriasis. You can use this ingredient in a number of ways to achieve smooth, supple skin that is free from infections. Ice Cube Method: Add 1 tablespoon wheatgrass powder to a cup of water and mix it well. Pour this juice in 3-4 holes in an ice cube tray and let it freeze. Rub a cube over the affected area for 2 to 3 minutes. Let it dry. Repeat this process. You can use this method every day for speedy recovery. Bathing Water Method: Add 2 to 3 tablespoons of wheatgrass powder to your warm bath and soak your body in it for at least half an hour for best results. Do this twice a week to eliminate skin diseases once and for ever. Excessive exposure to UV rays can harm your skin and cause sunburns. They are not only extremely painful, but can also cause cancer in the long run. The quick healing as well as anti-inflammatory properties make wheatgrass one of the best remedies for sunburns (5). 1. Mix wheatgrass powder and water and dab a fresh cotton ball in it. 2. Apply this solution to the affected area. 3. Let it sit for 5 to 10 minutes. Then, wash off and pat dry. 4. Repeat this process twice a week to get relief from sunburns. Wheatgrass powder is considered great for your hair. It is extremely beneficial when made into a poultice and applied topically on your hair. Some of benefits of wheatgrass powder for hair are given below. Rinsing your hair with wheatgrass powder is an effective remedy for dandruff as well as dry and itchy scalp. 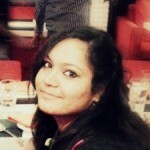 You can prepare a concoction of wheatgrass powder and normal shampoo and apply it on your hair to repair damaged hair. Premature graying is slowly becoming a problem with the younger generation. You can blame it on your haphazard lifestyle, but there is no denying that dying your hair even before your mom has to can be a little embarrassing. As for everything, nature has the solution for gray hair as well. Wheatgrass powder is effective in restoring the natural color of your hair. Rinse your hair with this powder to prevent graying. Having wheatgrass can facilitate a smooth digestion process. According to the American Cancer Society, wheatgrass powder contains certain alkaline minerals that provide relief from ulcers, constipation, and diarrhea. High levels of magnesium also help in relieving constipation. It is easily digestible and helps to cleanse the colon and restore the acidity levels to normal. Also, wheatgrass helps in maintaining a balance between various bacterial groups to keep your digestive system healthy. If they go off balance, they can make the body prone to diseases and health problems. Wheatgrass enables the harmful bacteria to perish and the good bacteria to develop and thrive (6). Wheatgrass powder contains abundant amounts of chlorophyll that helps in increasing hemoglobin production in the body. This increased production enables the blood to carry more oxygen and helps in the formation of red blood cells and white corpuscles (7). 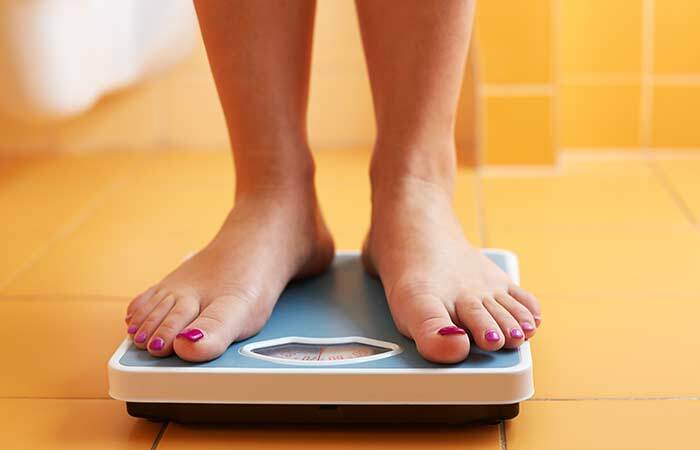 Wondering, how wheatgrass powder benefits weight loss? Well, wheatgrass powder is effective in managing weight. 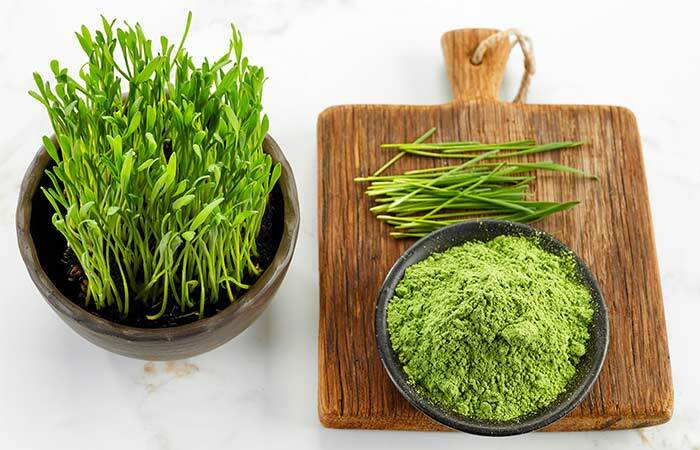 The powdered wheatgrass can be added to juices or smoothies and can be used as a healthier alternative to other ingredients and flavoring agents. It provides energy to the body and increases strength, which increases exercise duration and accelerates weight loss. Moreover, this powder helps to control weight gain by stimulating the thyroid gland. This boosts metabolism and prevents indigestion and obesity (8). Also, wheatgrass contains the mineral selenium that is essential for the proper functioning of the thyroid gland that, in turn, helps in weight management. So, have wheatgrass powder mixed with water first thing in the morning to lose fat quickly. Wheatgrass is an alkaline food supplement and it balances the body’s pH levels. Hence, it is beneficial for reducing the acidity in the blood and restoring its alkalinity (9). Wheatgrass powder contains excellent detoxifying properties. It contains several minerals, antioxidants, and enzymes that reduce inflammation. In this way, it improves cellular strength, detoxifies the bloodstream and liver, cleanses the colon, and protects the organs from carcinogens (10). The molecular structure of chlorophyll contained in wheatgrass is similar to that of hemoglobin in human blood. The high levels of chlorophyll found in wheatgrass powder, after being absorbed by your body, increase the production of blood and hemoglobin. Hence, it is perfectly logical to conclude that wheatgrass powder helps in curing anemia (11). Chlorophyll present in wheatgrass reduces the harmful effects of radiation. So, wheatgrass powder is often recommended to cancer patients during chemotherapy/radiotherapy. Chlorophyll and fiber can help in flushing out toxins accumulated in the bodies during chemotherapy and provide relief from the harmful side effects such as burning sensation, constipation, low energy, hair loss, and loss of good cells. Thus, it is one of the natural remedies to reduce the side effects of this treatment and facilitate quick recovery (12). Thinking what are the wheatgrass powder benefits for diabetes? Well, it helps in regulating blood sugar levels by delaying the absorption of carbohydrates. Thus, this supplement can control diabetes at the primary or advanced stages (13). As it has many beneficial nutrients, wheatgrass powder can be used as a natural cure for piles (hemorrhoids) (14). This can be attributed to the presence of chlorophyll, fiber, vitamins, and minerals that have proven to be extremely effective in the treatment of piles. For this purpose, it is recommended to take wheatgrass powder twice a day for three months continuously. Wheatgrass powder is a great supplement for treating tooth decay and other dental problems. Massaging your gums with wheatgrass powder can heal gum problems and make your gums tight and firm (15). This amazing supplement lowers and eliminates general inflammation. Thus, it provides relief from common body aches and pains (16). Regular consumption of wheatgrass supplements, such as wheatgrass powder, facilitates better vision (17). Varicose veins, also called varicoses, occur when your veins get dilated, enlarged, and overfilled with blood. These veins are often painful and have a swollen appearance, and are bluish-purple or red in color. Regular consumption of wheatgrass reduces the likelihood of developing varicose veins due to its potent anti-inflammatory action (18). Many studies have shown that body and breath odor particularly affect those who don’t have a fiber-rich diet. Scientists state that bad-smelling sweat may indicate problems in digesting dietary fats or a serious magnesium deficiency (19). Wheatgrass powder clears your blood and eliminates foul odors in your breath and sweat (20). Consuming wheatgrass powder regularly helps in enhancing the reproductive health of both men and women. It also increases vigor and helps in conception (21). Wheatgrass is loaded with so many essential nutrients that after its consumption, our body doesn’t require any food, at least for some time. It is scientifically proven that some nutrient deficiencies (particularly those of magnesium, iron, and omega 3s) can make you hungry even after a meal (22). The best way to tackle this problem is to take wheatgrass supplements regularly, without fail. One of the top reasons to have wheatgrass is because it greatly boosts our immune system (23). As established earlier, it helps increase the red blood cell (RBC) and white blood cell (WBC) counts in our blood. This, along with its antiviral and anti-inflammatory properties, helps strengthen the immune system (24). Wheatgrass, with its amazing ability to hike the amount of oxygen in the blood, is an effective tool to stimulate circulation in the system (25). An interesting study also shows that wheatgrass supplement, when taken before exercise, helps to prepare your system for the upcoming exertion. So, don’t forget to have a shot of wheatgrass just before your exercise routine to reap the maximum benefits. Many experts believe that wheatgrass is one of the best home remedies to treat arthritis (26). A 2012 study pointed out that rheumatoid arthritis patients who have wheatgrass drinks regularly saw decreased symptoms due to the ingredient’s strong anti-inflammatory action. Tiredness often symbolizes sleep deprivation and a weak immune system, which can be effectively treated with the help of wheatgrass. This amazing ingredient contains chlorophyll, which, apart from boosting our immune system, also assists in cell regeneration. This, in turn, helps heal our body and reduces fatigue. Additionally, chlorophyll helps boost our adrenal system, which is essential for the prevention of chronic fatigue. Wheatgrass is great for your liver (27). With its detoxifying properties, wheatgrass can revitalize your liver. In a study conducted in 2014, it has also been shown that having wheatgrass regularly can protect the liver from the harmful effects of alcohol. This natural ingredient improves the lipid levels, making it a great tool to manage the cholesterol levels. A 2011 study showed that continuous feeding of wheatgrass reduced hyperlipidemia in rats, which proves that it helps keep cholesterol under control (28). Wheatgrass has anti-inflammatory properties that make it an ideal home remedy to clear clogged sinuses. As explained earlier, wheatgrass helps in blood oxygenation, which can be a major reason for its anti-cancer properties (29). 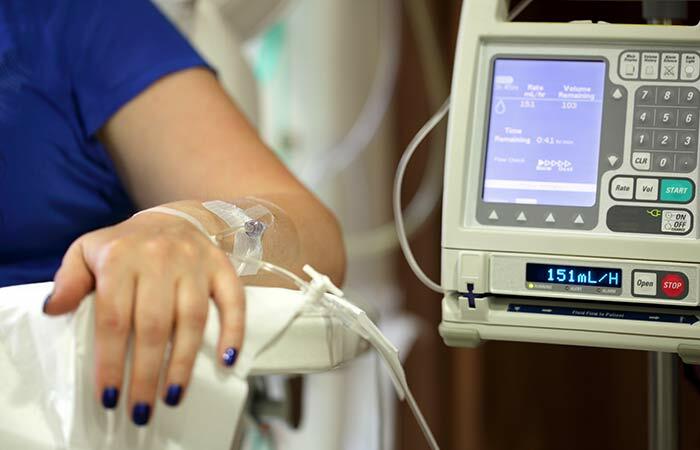 Cancer cells thrive in a low oxygen environment. This can easily be countered with the help of wheatgrass. Additionally, this ingredient has enzymes that help fight carcinogens and reduce the toxic load of radiation. So, have a glass of wheatgrass juice first thing in the morning to prevent cancer. The after effects of drinking too much alcohol can be really annoying, especially when you have to deal with a hangover. Wheatgrass juice is highly alkaline in nature, which helps neutralize the acidity in the blood caused by the alcohol intake. Wheatgrass also helps uplift your mood in a number of ways. It is rich in vitamin K and magnesium. It boosts the adrenal system and helps your body deal with stress. Additionally, wheatgrass contains a good quantity of iron, the deficiency of which can cause fatigue that eventually worsens your mood. It also helps fight depression. Did you know that a single glance at your nails can give away your health status? 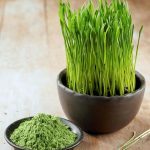 Weak, brittle, and yellow nails indicate poor circulation and lack of iron in your diet, which can easily be corrected with the help of wheatgrass. As established earlier, wheatgrass helps boost the RBC count in the blood, thus providing life to the lackluster nails. Irregular and painful menses are often due to the deficiency of vitamins and minerals like niacin and magnesium in your body. Thankfully, wheatgrass is abundant in all types of vitamins and minerals, which makes up for any deficiency in your diet. Wheatgrass has strong anti-inflammatory properties that help fight bowel inflammation, including Crohn’s disease and Irritable Bowel Syndrom (IBS). Those expecting a baby should definitely include wheatgrass in their diet. As we already know, wheatgrass is full of essential earth nutrients that promote healthy growth of the fetus. Additionally, its regular consumption boosts hemoglobin production in the body, which, in turn, prevents anemia. Wheatgrass powder also alleviates pregnancy-related digestive issues like bloating, constipation, and diarrhea by regularizing bowel movements. For best results, try having wheatgrass powder when your stomach is empty i.e. first thing in the morning. Wheatgrass is very beneficial for those suffering from polycystic kidney disease. 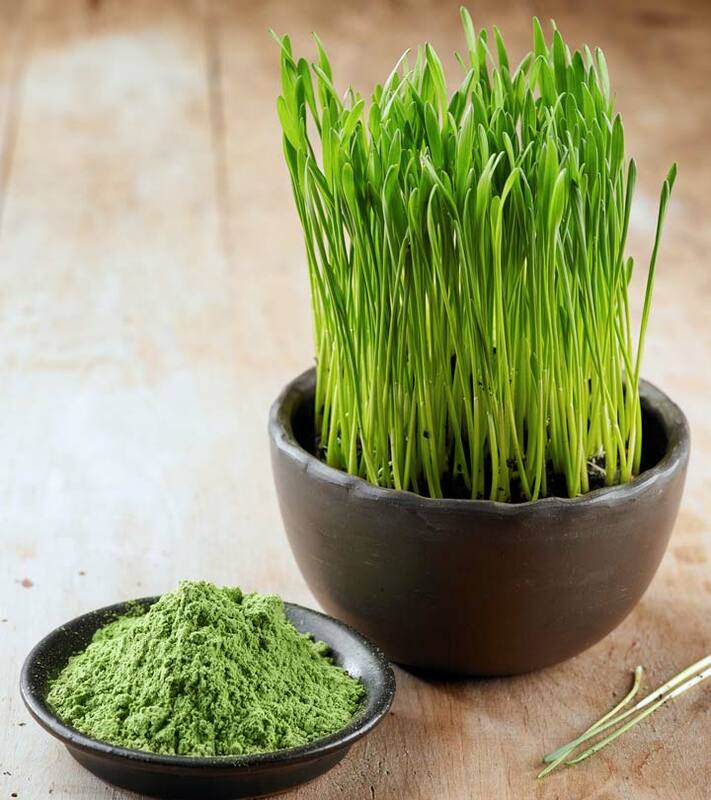 Consuming wheatgrass powder regularly has shown to relieve the subsequent symptoms of kidney cysts, including severe back pain and abdominal pain. Wheatgrass also helps slow down the growth rate of the cysts, thus killing the root of the problem. Check out here wheatgrass powder nutritional benefits. Headache And Nausea – Nausea is a queasy sensation that you feel before you throw up. It usually sets in when there is a detoxification process going on in your body. Some people experience nausea after consuming wheatgrass juice. As mentioned earlier, wheatgrass consists of huge amounts of chlorophyll. This helps in the process of toxin removal by inducing the tissues to release the stored toxic elements. This sudden release of toxic elements can result in nausea, which is often accompanied by severe headache and dizziness. Besides headache and nausea, some of the most common detox symptoms are stomachache, skin eruptions, coughing, nasal congestion, and mild fever. Diarrhea – Avoid overconsuming wheatgrass. Once daily is fine, but more than that can lead to acute diarrhea due to the system’s inability to digest it. Allergies – People who have past cases of wheat sensitivities should avoid using wheatgrass. If you develop a reaction after consuming this, immediately consult a doctor. How to use wheatgrass powder? There are two ways in which you can use wheatgrass powder – as a dry supplement or in the juice form. The best way is to add 3 grams of wheatgrass powder (1 teaspoon) in warm water and mix it. Drink it every day on an empty stomach. If you don’t like the taste, make a smoothie with wheatgrass powder and fresh fruits. Add a dash of lemon. Does wheatgrass help your hair grow faster? Definitely yes, regular consumption of wheatgrass powder/juice will help your hair grow faster due to the presence of vitamins B12 and C, iron, and iodine. They strengthen your hair follicles, thus preventing breakage and hair fall. 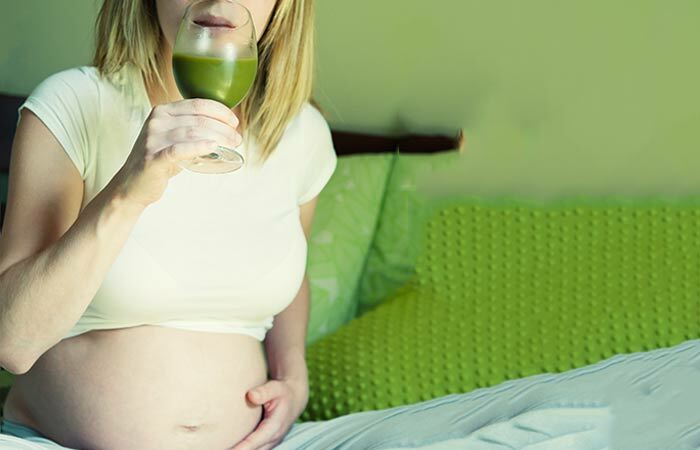 Is wheatgrass powder safe during pregnancy? Yes. You can use wheatgrass powder during pregnancy. But, it is better to seek your doctor’s approval before including it in your diet, especially if you have a history of wheat allergy. What is the difference between wheatgrass juice and wheatgrass powder? While wheatgrass juice is directly extracted from it, wheatgrass powder is the dried and dehydrated form of the wheatgrass plant. Both contain all the natural nutrients of the wheatgrass. So, you may choose whatever suits your taste. Wheatgrass is a elixir for our health and helps fight a number of diseases (physical or psychological), including skin diseases, cancer, bowel inflammation, obesity, and stress. So, it’s no wonder that it has been named as one of the superfoods. It’s impressive how folks are slowly becoming ‘wheatgrass obsessed’ despite the ‘grassy’ flavor it has, and I would advise you to do the same. So, you have got a clear idea about what are organic wheatgrass powder benefits and side effects. Did you find this article useful? Write it down in the comment section below.